OpenTable.comTM is an online real-time restaurant reservation service that provides a fast, efficient way to find available tables that meet desired criteria for cuisine, price and location. 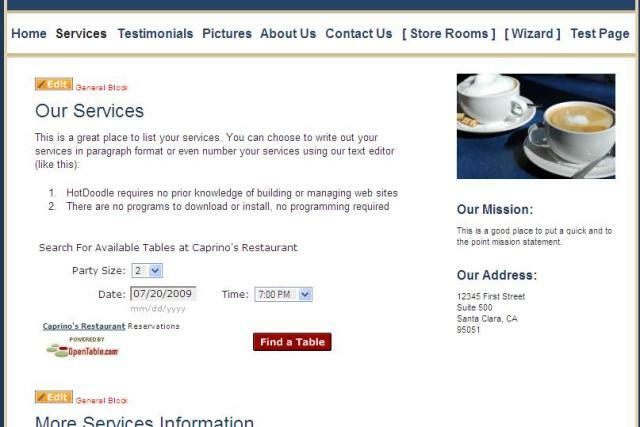 Hotdoodle provides you an OpenTable Block by which you could incorporate online reservations on your website. 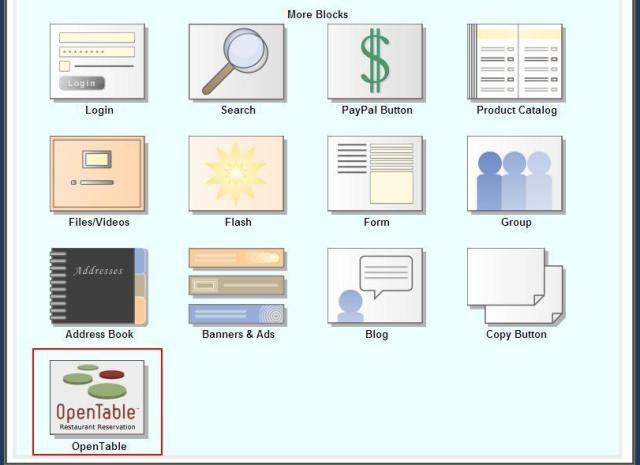 Let’s add a new OpenTable Block. The OpenTable Block provides three different views. If you just need to provide an URL link, you could use the first (Default) view. 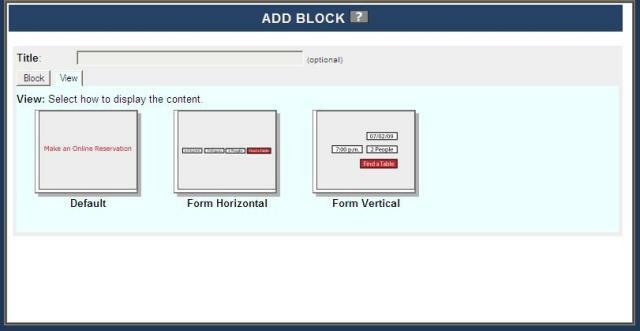 The second (Form Horizontal) and third (Form Vertical) view would display Integrated Search from within your website that would allow your user some search options as well. 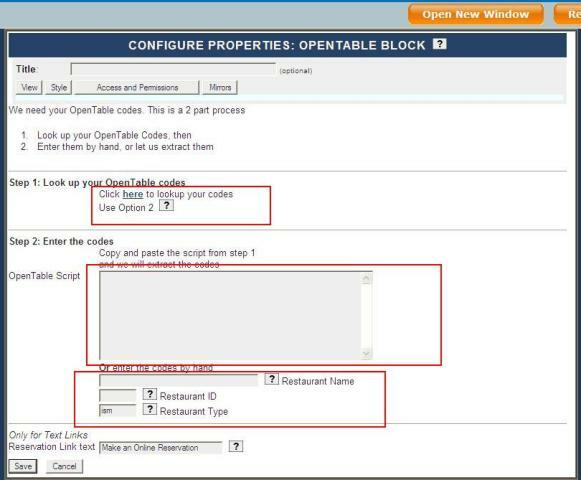 There are two steps involved in configuring the OpenTable Block. 1. 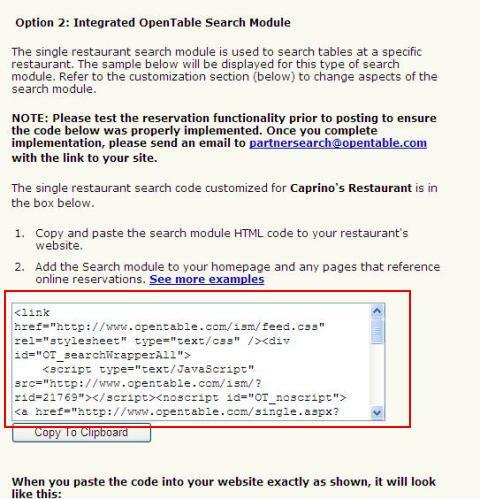 In step 1, you need to click on the link provided, which opens the OpenTable website where you can generate the code as shown below. Just choose your country, state, city, Restaurant and it will generate the requisite code. Note: Remember to use Option 2. 2. Once you have the script generated, there are two options available now. 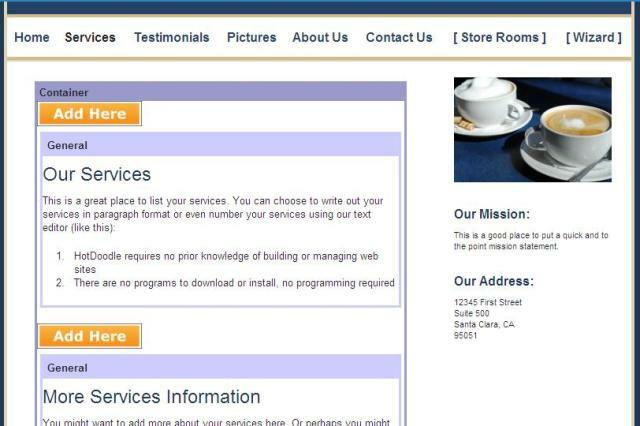 b) Copy paste the script into the text box provided and HotDoodle will auto determine the Restaurant Name, ID and Type. If you choose to hand enter the values, you need to provide the Restaurant Name, ID and Type as shown in the screenshot below. Restaurant Name will be the name of your restaurant like “My Coffee Shop” or similar. This is required. Restaurant ID is again mandatory. In the script it generates, look for “rid=xxxx” where xxxx is your Restaurant ID. For example, if it is rid=1234, then you need to type 1234 in the box provided for Restaurant ID. Similarly, in the script generated, look for “rtype=xxxx” where rtype is your Restaurant Type. You could however leave the Type as (‘ism’) which is the default value or enter the value as per the script generated by OpenTable. If you choose to copy paste the script, HotDoodle will auto determine the values. 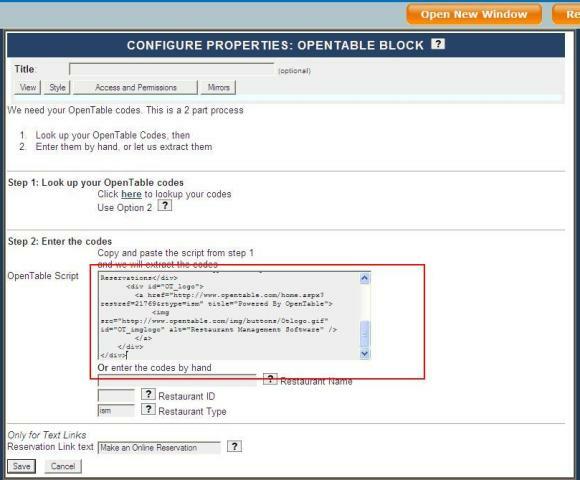 So copy the script code generated by OpenTable in Step 1 and paste it in the text box provided and click on Save. 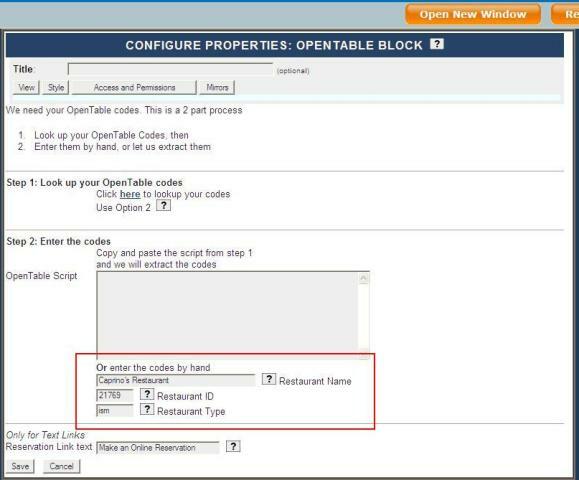 HotDoodle will automatically determine the values, so if you click on config for your OpenTable block you will see the values for Restaurant Name, ID and Type filled in. As a note, the script you pasted is no longer saved as the values are determined. If the values you provided are correct, HotDoodle OpenTable Block would generate the Integrated Search for your Reservation on your Website as shown in the screenshot below.